Fill it with full size bottles of BBQ sauce from Gates, Bryants, even KC Masterpiece for a tasted of Kansas City. Add in summer sausage, cheeses, crackers and fruit. Include a selection of cookies and chocolates from A Sweet Expression. It will pleasure the palatte. 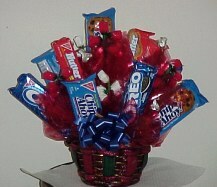 An explosive display erupts from a basket of your all time favorites, Oreos, Chips Ahoy and Nutter Butter cookies, exploding into a grand show of blues and reds. 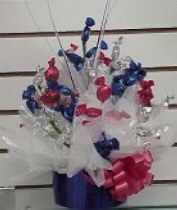 A mixture of three candies help celebrate our nation's birthday. Send a basket of delicious cookies.